This is a continuation of Dr Hseu's lecture on "Lingzhi and Modern Medical Science". For Part 1 - Lingzhi History and Background, please click here..
During the 1950s and 1960s, the Chinese had made use of various Lingzhi formulations, which were prepared either by liquefying Lingzhi or by concocting it with alcohol. The local folks used these preparations as healing remedy for all kinds of ailments. This was a common medicinal practice that was adopted by the China folks during 1950s and 1960s, which was later recorded and reported in articles or documentary records. When scientists from other countries subsequently read such records, they were impressed by the various therapeutic functions of Lingzhi, and fascinated by its miraculous effects in treating cardiovascular diseases, respiratory illnesses, disorders in liver functions etc. They recognise that Lingzhi possesses unique features that are exclusive to its own and therefore began to engage in systematic study on Lingzhi. 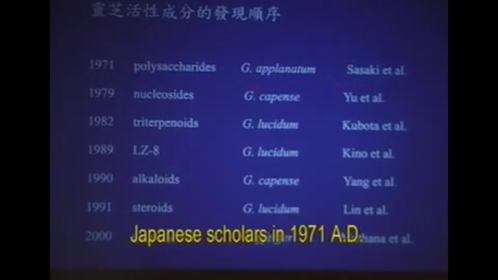 The first constituent of Lingzhi, polysaccharide, was found and extracted from G.Applanatum by Japanese scholars in 1971. Why was it from G.Applanatum and not Reishi? The reason is that in 1971, artificial cultivation technology of Lingzhi was not fully developed yet, therefore extraction of Lingzhi was mainly done from wild-grown Lingzhi. G.Applanatum were more easily found in the wilderness in comparison to Reishi, therefore it was widely used in Lingzhi researches. In 1979, Chinese scholars have successfully discovered macromolecular polysaccharide in Lingzhi. 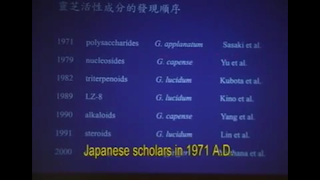 Subsequently in 1982, Japanese scholars had successfully extracted triterpenoids. or ganoderic acids from Lingzhi. There is an interesting story behind the discovery of triterpenoids. Japanese like to eat sweet stuff, while Lingzhi is bitter in taste. Therefore, they racked their brains trying to get rid of the bitterness. When the bitter taste was successfully precipitated, the residue structure was brought to the attention of researchers specialising in cellular structure. This was how they hit the jackpot of triterpenoids discovery.